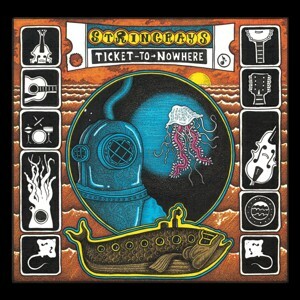 The new 5-piece album Ticket to Nowhere is available right here (or at BandCamp). Give the gift of fun, independent music for the holidays. US shipping is $3 no matter how many you order. For easy car-listening.... 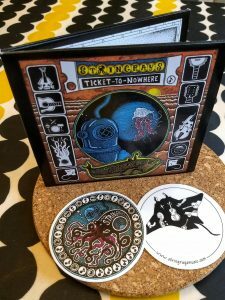 Physical copy of the album in a beautiful package full of hand-drawn artwork by Ben Belcher. Digital download a for instant gratification. Bonus stickers: While supplies last, we'll add in a very cool Stringrays sticker or two. Slap 'em on your water bottle. On your car. On your friend's car. (On your enemy's car....) And, yes, it makes a great gift. A digital download of the album in high-quality mp3 320 format. Includes cover art and liner notes. Physical copy of the album and a digital download of the album for instant gratification. Ticket to Nowhere (just released) features the 5-piece band — Rodney Miller, Sam Bartlett, Max Newman, Stuart Kenney, Mark Hellenberg — playing dance-inspired New American fiddle tunes. Be warned, if you leave your car stereo on repeat, you may unwittingly drive cross-country. 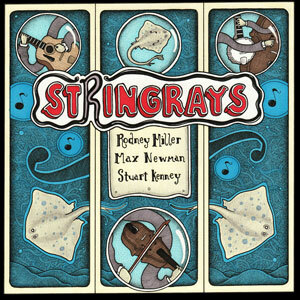 Stringrays (2014) self-titled album features the trio — Rodney, Max, & Stuart — on a variety of compositions new and old, including some of Rodney’s as well as a few fiddle showstoppers and novelty pieces. The music on both albums is complemented by Ben Belcher’s lusciously detailed hand-drawn artwork.